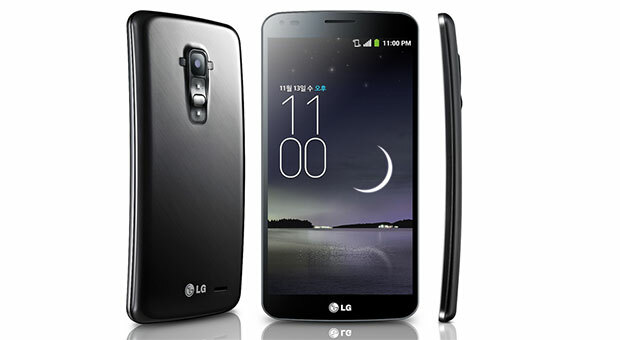 LG's unveiled all the details for its often-leaked, curved screen smartphone. Weighing in at 177g with a 6-inch (but 720p) curved OLED display, it's powered by a Snapdragon 800 processor and 2GB of RAM, with a 13-megapixel camera housed above the two rear control buttons, which is now LG's thing. In comparison to Samsung's Galaxy Round, the screen on the G Flex arcs from top to bottom, not side-to-side, which at least makes a little more sense to us, hopefully fitting in better to the curvature of the users' face. We're yet to handle either curved phone IRL just yet, however, when we'll be able to offer up a better perspective on how both devices actually feel. Like LG's recent G2, there's high-fidelity audio recording and playback, dual-window app functionality and tap-to-wake on that substantial touchscreen. There's also special animations, depending on where and how you unlock the phone. The Korean press release is also reporting that there's a self-healing coating that can repair hairline scratches on the rear of the phone. LG says they are repaired "within minutes." Korean smartphones with the power to control the elements are, however, still TBC. The G Flex will arrive on Korea's three major carriers next month -- but (again) there's no word on global roll-out, hinting that the smartphone could well be a test model for the company.